As Washington, D.C. adjusts to a new administration, the fiscal carnage caused by past presidents continues to haunt the United States. The national debt nearly doubled under former President Obama and is poised to exceed $20 trillion before the end of 2017. 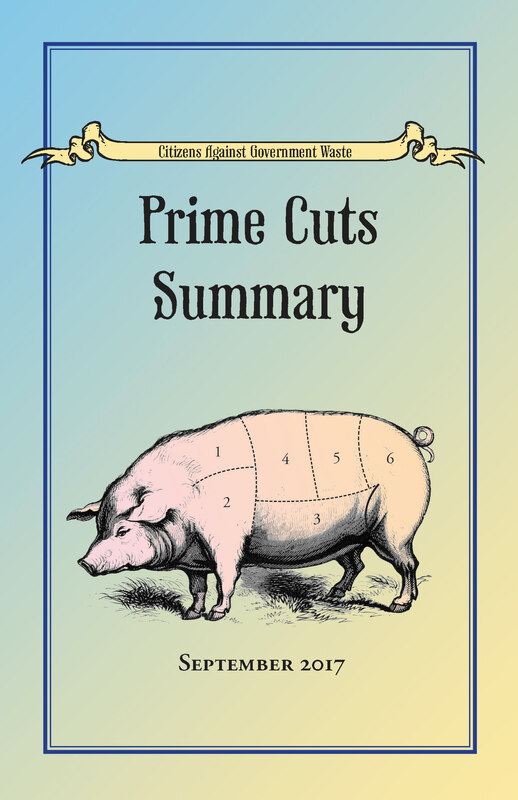 To help chart a path out of this calamitous economic hole, Citizens Against Government Waste (CAGW) is releasing Prime Cuts 2017, a comprehensive account of options the federal government possesses to cut into the constantly growing debt. CAGW has been publishing Prime Cuts since 1993. The 2017 version contains 607 recommendations that would save taxpayers $336.2 billion in the first year and $2.3 trillion over five years. The Congressional Budget Office (CBO) estimates that the fiscal year (FY) 2017 budget deficit will be $693 billion. If all the Prime Cuts recommendations were adopted, a balanced budget could be achieved within three years. Since CAGW’s inception in 1984, the implementation of its recommendations has helped save taxpayers $1.8 trillion. Prime Cuts 2017 addresses every area of government spending. For example, the report proposes eliminating the Market Access Program (MAP), which aims to help agricultural producers promote U.S. products overseas. However, MAP is really a corporate welfare program that funnels millions of dollars to large, profitable corporations and trade associations that can well afford to pay for their own ads. Eliminating MAP would save taxpayers nearly $1 billion over five years. Finally, numerous cuts could be made to the Department of Defense (DOD) without jeopardizing national security, including eliminating congressional add-ons for the F-35 Joint Strike Fighter program. The F-35 is $170 billion over budget and is on pace to become the most expensive weapon system in history, including an estimated lifetime cost of $1 trillion for operation and maintenance. By following the blueprint provided by CAGW’s Prime Cuts 2017, wasteful government spending can be cut and the nation can start on a path toward fiscal sanity. Prime Cuts 2017 is essential reading for taxpayers, the media, and legislators alike. CAGW’s 2017 Congressional Pig Book identified a $10 million earmark for high energy cost grants within the RUS. Since FY 2002, members of Congress have added seven earmarks for high energy cost grants totaling $123.5 million. Consumers are paying about $3.5 billion more each year in artificially inflated prices for commodities that use sugar, including baked goods, beverages, candy, cereal, dairy products, snack foods, and hundreds of other products. The program has been costly to the economy as well. According to the Department of Commerce, “Between 1997 and 2014, 132,000 jobs were lost in sugar-using industries.” For every sugar growing job that is protected under the program, about three manufacturing jobs are lost. Formerly known as the Market Promotion Program, MAP is one of the federal government’s most blatant examples of corporate welfare. Over the past decade, MAP has provided nearly $2 billion in taxpayer money to help agriculture trade associations, farmer cooperatives, and individual companies advertise their products overseas. In FY 2015, MAP allotted $173 million to groups like the Cotton Council International, U.S. Meat Export Federation, and the Popcorn Board. Previous beneficiaries have included successful companies such as Blue Diamond, Sunkist, Tyson, and Welch Foods. Many economists believe that the cost of the expanded crop insurance programs will significantly exceed initial estimates, as crop prices are beginning to fall much sooner than projected. A December 8, 2016, CBO report found that if the ARC and PLC programs were eliminated for all crops, taxpayers would save $4.2 billion over the next decade. The acquisition misadventures of the JSF program have been well-documented. In development for nearly 16 years and six years behind schedule, the program is approximately $170 billion over budget and has encountered an abundance of persistent issues. An April 2015 Government Accountability Office (GAO) report noted that the lifetime operation and maintenance costs of the most expensive weapon system in history will total approximately $1 trillion. The Tennessee Valley Authority (TVA) is a multibillion dollar federally-owned and-operated corporation established in 1933 in an effort to bring electricity and development to some of the most underdeveloped parts of the Southeastern United States. TVA’s non-power responsibilities include recreational programs, the promotion of public use of federal land and water resources, and the operation of a national fertilizer research center. Congress appropriates nearly $140 million annually for these non-power duties. As the CBO pointed out in its FY 2011 “Spending and Revenue Options” report, “unlike private utilities, TVA does not have to provide a return to equity holders – in this case, the taxpayers, who are exposed to the risk of having to make up for future revenue shortfalls.” According to TVA’s FY 2017 budget proposal, its debt is projected to reach $29 billion by FY 2017, bringing it perilously close to the $30 billion debt cap established by Congress. Despite this huge debt, the TVA has not relinquished its hold on electric utilities across the Southeast by turning its duties over to the private sector. In his FY 2012 budget, former President Obama proposed eliminating targeted water infrastructure grants because they “are duplicative of funding available for such projects through the Clean Water and Drinking Water State Revolving Funds (SRFs), but are not subject to the State priority-setting process for these programs, which typically funds cost-effective and higher priority activities first.” In other words, the grants are another example of the hundreds of redundant federal programs that should be eliminated. President Donald Trump also proposed eliminating the grants, making it a rare point of agreement between the two administrations. Since FY 1996, 1,823 earmarks costing taxpayers $1.1 billion have gone toward water infrastructure. Only four of the 20 products submitted, or 20 percent, were required by ENERGY STAR to be cleared by an independent third party. Taxpayers should not be forced to tolerate ENERGY STAR results that are close to the Mendoza Line. Since the beginning of the RAC program, $11.3 billion has been returned to the Medicare Trust Fund. In FY 2013 alone, RACs collected $3.65 billion, according to the Medicare Trustees’ report to Congress on the program. Only $57.6 million of that amount, or 1.6 percent, was overturned at the first level of appeal. In addition, only 9.3 percent of all claims that reached the top level of appeal to administrative law judges was overturned in FY 2013. Criticism of the RACs by hospitals and other providers has been a significant factor in pushing both CMS and Congress into suspending audits, which is a subversion of the spirit, if not the letter, of the law. These complaints are both overblown and inaccurate. RACs audit only 2 percent of claims and must receive pre-approval of audits by CMS. Each audit is overseen by a medical professional. Attempts to gut the RAC program contravene CMS’s own data that the RAC program led to a reduction in the error rate of Medicare improper payments. After the rate of improper payments dropped from 10.8 percent in FY 2009 to 8.5 percent in FY 2012, they rose to 11 percent in FY 2016. Members of Congress should not only stop giving in to pressure to weaken the RAC program, they should reinstate and safeguard the RACs. Otherwise, Medicare will have little chance of dropping down from its current – and growing – position as number one in improper payments. According to the U.S. Census, average life expectancy at birth for all Americans increased from 59.1 years in 1935, the year Social Security was established, to 78.8 years in 2016. But the eligibility age for Social Security has hardly moved. Reforming the NRA immediately so that it reaches 67 for workers born in 1951 and 70 for workers born in 1969, and raising it by one month every other year thereafter until it reaches 70 for all retirees, would save taxpayers $7.6 billion over the next five years, according to a December 2016 CBO report. The populations that receive Medicare and Social Security are identical; thus, it makes sense that the eligibility age for each should be raised simultaneously. Medicare alone is expected to cost more than $1 trillion annually by 2020 and will become insolvent by 2030. The 2017 Medicare Trustees Report projects Medicare spending as a percentage of the economy to increase from 3.6 percent in 2016 to 9 percent in 2090. Currently, Medicare recipients can begin collecting benefits at the age of 65. According to a December 2016 CBO report, using 2017 as the starting point to increase Medicare’s eligibility age by two months annually until it reaches 67 would reduce Medicare costs $55.2 billion by 2026. In the 1970s, many American cities suffered from destitution and blight. During the 1977 World Series, swathes of New York’s South Bronx burned to the ground as Howard Cosell narrated on national television. It was in that era when Congress created CDBGs in an effort to revitalize low-income areas in cities across the country. The money was intended for infrastructure investments, housing rehabilitation, job creation, and public services in metropolitan cities and urban counties. The program was intended to be flexible, but more than $100 billion given away to local governments over the last 35 years has fallen short on both accountability and results. Buffalo, New York, has received more than $500 million in CDBGs over the last 30 years, with little to show for it, and Los Angeles handed out $24 million to a dairy that went bust 18 months later. The CDBG formula for eligibility does not take a community’s average income into account. As a result, several very wealthy cities with robust tax bases, such as Greenwich, Connecticut, have received CDBG dollars. A September 2012 GAO report found that “some cities with higher unemployment rates received less funding per unemployed person than other cities with lower unemployment rates.” Even former President Obama recommended reducing CDBG funding because “the demonstration of outcomes [is] difficult to measure and evaluate.” President Trump’s FY 2018 budget included the elimination of the entire CDBG program. In 2010, GAO found that NeighborWorks America was one of many federal programs to have supplied grants to ACORN, the community organizing group accused in recent years of voter fraud and other scandalous behavior. ExpectMore.gov, the George W. Bush administration’s rating system for federal programs that was managed by the Office of Management and Budget (OMB), called NeighborWorks America only “moderately effective,” and stated that it “lacks measures that focus on neighborhood change or outcomes in the lives of those it assists.” According to CBO, NeighborWorks duplicates low-income housing, community development, and homeownership programs that already exist within the Department of Housing and Urban Development (HUD). The 1980 Alaska National Interest Lands Conservation Act (ANILCA) created 104 million acres of wilderness areas, national parks, and wildlife refuges, including the 19 million acre ANWR. ANILCA stipulated that potential petroleum reserves should be researched. In 2009, the CBO stated that “ANWR’s coastal plain appears to have the best potential for oil production of any unexplored onshore area in the United States.” A February 2012 CBO report found that leasing portions of ANWR to private firms for oil and natural gas production would result in a decrease of $2.5 billion in direct spending by the federal government, even before post-extraction royalties. ANWR drilling would further reduce America’s dependence on foreign energy while lowering gas and oil prices. The area that would be drilled makes up less than 1 percent of ANWR, making the protests against drilling seem small and unimportant. The federal government currently owns roughly one-third of all U.S. land, including more than 80 percent of Alaska and Nevada and more than half of Idaho, Oregon, and Utah. A March 2000 CBO report stated that the National Park Service (NPS), the Forest Service, and the Bureau of Land Management might better meet “environmental objectives such as habitat protection and access to recreation … by improving management in currently held areas rather than providing minimal management over a larger domain.” In 2003, the GAO reported that the NPS’s maintenance backlog was more than $5 billion. Since then, federal land acquisitions have accelerated, placing even greater burdens on an obviously inefficient and overstrained system. On March 14, 2017, Congressional Research Service (CRS) reported that the NPS’s maintenance backlog was $11.9 billion and poised to increase. A signature plan of the Clinton administration, COPS was intended to reduce rising crime rates in the early 1990s by providing federal grant money for the hiring of 100,000 police officers to patrol American streets. Two decades later, the program has failed to reach its stated goals and has fallen victim to hundreds of millions of dollars in waste, fraud, and abuse. On top of the waste and mismanagement, COPS requires that recipient cities keep the program running on their own dime for at least one year after the grant money runs out, which creates another unfunded mandate for local governments already strapped for cash. COPS has also long been a prime repository for pork; since FY 1998, members of Congress have crammed 2,872 earmarks, costing taxpayers $1.8 billion, into the Commerce, Justice, Science, and Related Agencies Appropriations bills. On the bright side, legislators have not included an earmark for COPS since FY 2009. In 2005, Congress merged several DOJ grant programs under the JAG umbrella. Unfortunately, the program gives away money with too much flexibility, no effective targeting strategy, weak oversight, and few consequences for mismanagement of the funds. JAG funds have been frequently earmarked, with 2,449 earmarks costing $1.8 billion since FY 2001, and the program has turned into an open-ended subsidy for states’ routine operational law enforcement expenses. JAGs are certainly accomplishing government waste and, therefore, the program should be terminated. A 2013 CBO analysis found that repealing Davis-Bacon would save taxpayers $13 billion between 2015 and 2023. Since Amtrak was created in 1971, it has cost taxpayers more than $40 billion. The railroad was supposed to earn a profit but has continuously failed to do so. For example, a 2009 study found that taxpayers paid $32 in subsidies per Amtrak passenger in 2008. By booking a month in advance, it is possible to buy a round-trip plane ticket from New Orleans to Los Angeles and back for less than the $437.82 that Amtrak loses per passenger on a one-way trip between those same locations. To make matters worse, an August 2012 New York Times article reported that Amtrak had lost $834 million on food service alone since 2002, largely due to employee theft. Amtrak boasts that ridership continues to increase by 3.5 percent a year, with the majority of this increase coming from Amtrak’s Northeast corridor routes. Amtrak admits that those same routes are the only ones turning a “net profit.” None of the long-distance, lesser-used routes were projected to turn a profit. In fact, Amtrak stated that these lines cost the most to operate and bring in the least amount of revenue. Given this information, any well-managed privately owned business would have shut down these lines years ago. As a consequence of this mismanagement, Amtrak’s FY 2016 net operating loss was $227 million. But, instead of exorcising its ineptitude, Amtrak has requested a budget of $1.8 billion for FY 2017. The Federal Aviation Administration funding bill that passed in February 2012 limited EAS funding recipients to airports that are more than 175 miles from a major hub and that move more than 10 passengers a day. Limits are insufficient; the EAS needs to be grounded. When it was started, AmeriCorps was hailed by former President Clinton as a catalyst for strengthening community service and youth volunteerism. Instead, it has become a taxpayer-subsidized operation with amorphous goals and little to no measurement of its accomplishments. For almost $350 million annually, Americans deserve better than a glorified resumé booster. Sen. Jeff Flake (R-Ariz.) identified dozens of absurd NEH and NEA expenditures in his 2016 Wastebook: Porkemon Go, such as $206,000 for monkey puppet shows and $1.7 million for a Hologram Comedy Club. The ARC was created by Congress in 1965 to “bring the 13 Appalachian states into the mainstream of the American economy.” The commission represents a partnership of federal, state, and local governments, and covers all of West Virginia along with portions of Alabama, Georgia, Kentucky, Maryland, Mississippi, New York, North Carolina, Ohio, Pennsylvania, South Carolina, Tennessee, and Virginia. The ARC provides funding for several hundred highways and development projects throughout the Appalachian region. The commission is duplicative of dozens of other programs that exist at the federal, state, and local levels, and unfairly focuses on a region of the country that is no more deserving than other impoverished areas. Since FY 1995, the ARC has received eight earmarks totaling $221.5 million for projects in Alabama, Kentucky, and West Virginia. A September 2014 GAO report found that the Denali Commission Office of Inspector General (OIG) provided extremely limited oversight of the commission’s major programs during FYs 2011-2013. According to the report, “analysis of the 12 inspections completed by the OIG found that the OIG provided oversight for $150,000 of the $167 million in grant funds disbursed during fiscal years 2011 through 2013.” The amount of funding inspected by the OIG added up to less than 1 percent of grants awarded by the Denali Commission over this period. Regular readers of CAGW’s Congressional Pig Book know that the program has long been heavily earmarked. Since FY 2000, 27 projects worth $335.1 million have been earmarked by members of Congress for the Denali Commission, including Senate Energy and Water Appropriations Subcommittee member Lisa Murkowski (R-Alaska), former Sen. Mark Begich (D-Alaska), Rep. Don Young (R-Alaska), and the late Sen. Ted Stevens (R-Alaska). When they were taken under government conservatorship in 2008, Fannie Mae and Freddie Mac were government-sponsored enterprises (GSEs) with special benefits not afforded to other firms in the secondary mortgage market, including lines of credit through the U.S. Treasury, exemption from income taxes, and some freedom from Securities and Exchange Commission oversight. Their biggest advantage was their implicit federal guarantee; in a crisis, Uncle Sam was assumed to be willing to step in to bail out the mortgage giants, which allowed Fannie and Freddie to borrow at lower rates than would otherwise have been possible. Even after taxpayers were forced to bailout Fannie and Freddie to the tune of $187 billion, their losses continue to this day, including a loss of $3.6 billion for Freddie Mac alone in FY 2015. The federal government should disentangle taxpayers from Fannie Mae and Freddie Mac before they are put on the hook for future bailouts. The FHA runs a $1 trillion mortgage insurance program that was originally designed to help low- and moderate-income individuals buy houses if they cannot provide a 20 percent down payment. FHA is the largest single provider of mortgage insurance and has a 100 percent guarantee of payment to lenders, should the homeowner default. Historically, FHA has controlled about 10-20 percent of the mortgage market. But after Congress increased the size of mortgages the agency could insure from $360,000 to $625,000, FHA controlled about 60 percent of the low down payment mortgage market from 2008-2010. That means the income eligible for FHA mortgage insurance went from the national average of about $64,000 to $110,000. Put another way, more than twice as many people can get FHA insurance than they could before the income limit was raised. At the same time that eligibility has exploded, FHA has faced serious solvency problems, culminating in a $1.7 billion bailout from the Treasury at the end of 2013. Overall, CBO estimates that FHA insurance cost taxpayers $15 billion from 2009-2012. Nonetheless, the agency’s website falsely claims it is the only federal entity that operates entirely on fees and costs the taxpayers nothing. Even with all the taxpayer money that has been thrown at the agency, FHA is seriously undercapitalized. The law says the agency needs to keep 2 percent cash on hand, or about $18-$20 billion, but, as of the beginning of 2015, it had less than half of 1 percent, or $4.7 billion. FHA could be self-sustaining if it charged enough in premiums and fees. Instead, on January 28, 2014, FHA lowered its mortgage insurance premium by 37 percent, from 1.35 to .85 percent, and it is estimated that it will reach the required 2 percent capitalization sometime in 2017 at the earliest. During 2014, private mortgage insurers made headway in chipping away at FHA’s market dominance, going from rough equilibrium to recapturing about 10 percent or more of FHA’s business by year end. But the premium reduction makes FHA insurance cheaper and preferred for many borrowers who would otherwise have used private mortgage insurance. And, as always, FHA insurance can be transferred to a new owner when a home is sold, unlike private insurance. “The stark reality is that USPS’s business model is broken,” stated a September 2011 GAO report. Indeed, as many countries around the world have moved away from state-owned to private postal services, the USPS remains intransigent. Even worse, the agency wants to double down and enter into a series of new ventures that compete with existing private-sector businesses, rather than transition its core operations into private hands. The “broken” business model includes massive financial and management failures. In FY 2016, the USPS lost $5.6 billion despite an increase in revenue. The agency has lost a total of $63.6 billion over the last decade. These numbers do not tell the entire story, since they do not include approximately $46 billion in additional obligations for pensions and retiree health benefits. In addition, the USPS has reached its statutory borrowing limit of $15 billion. According to a September 22, 2014, CRS report, since FY 2006, “Mail volume has dropped sharply — to 158.4 billion pieces in FY 2013. Mail volume, then, was 21.7 percent lower in FY 2013 than in FY 2003, and 25.7 percent below its FY 2006 peak.” Volume is projected to continue to decline as a result of the ongoing migration of communications and transactions to overnight services and the Internet. According to a November 2014 GAO report, USPS has a $72 billion operating budget and labor costs are $56 billion, or 78 percent of the total. According to GAO, between 2006 and 2013, the USPS winnowed its workforce from approximately 796,000 to 618,000 employees, or about 22 percent. Total work hours also decreased by 27 percent, from 1.5 billion hours to 1.1 billion hours, during that timeframe. Yet, the agency’s personnel expenses didn’t decline concomitantly. Instead, increased cost-of-living allowances, richer benefit packages negotiated with its unions, and a steady rise in healthcare costs will cause the USPS to spend $2 billion more for personnel in FY 2015 than it did in FY 2014. On February 26, 2015, the three Democratic commissioners at the Federal Communications Commission (FCC) ignored two prior court decisions on net neutrality, and approved the Open Internet Order (OIO) to use Title II of the Communications Act of 1934 to regulate the internet as a common carrier. In other words, the vibrant and competitive Internet would be regulated like the stodgy American Telephone and Telegraph Company when it was a monopoly telephone provider. The reclassification of the internet under the OIO was not about net neutrality. It was instead a decision to apply several provisions of Title II to internet service providers (ISPs), which resulted in stripping the Federal Trade Commission (FTC) of its jurisdiction over consumer protection and privacy for internet service subscribers, even though the FTC had been adequately protecting consumers online. Prior to the FCC action, the internet flourished largely due to a “light regulatory touch” and lack of government interference that began during the Clinton administration. According to USTelecom, the private sector invested more than $1.5 trillion in broadband between 1996 and 2015, $750 billion of which was used to build wireline infrastructure. In 2015, private sector broadband investment was $76 billion. On May 18, 2017, the FCC adopted a notice of proposed rulemaking (NPRM) that seeks to rescind the Title II reclassification and restore internet freedom under the same light touch regulatory mechanism that allowed the internet to thrive for decades. On July 14, 2017, CAGW filed comments with the FCC in support of the NPRM, which noted that the adoption of the OIO was a misguided attempt to solve a crisis that didn’t exist, and fully supported reinstating the classification of internet services as information services under Title I of the Communications Act of 1934. Due to a combination of negative incentives and unnecessary red tape, selling federal real estate is a long, costly process. Reforms are essential, because Uncle Sam owns more real property than any other entity in America: 900,000 buildings and structures covering 3.38 billion square feet. A June 2012 GAO report estimated that 77,000 federally-owned properties are underutilized or entirely vacant. OMB has estimated that maintenance on such properties costs taxpayers $1.7 billion annually. The GSA also operates the Federal Buildings Fund (FBF), which is funded by rent received from other agencies. The balance of the FBF, which is used to fund alterations, repairs, and construction projects, increased from $56 million in FY 2007 to $11.3 billion at the end of FY 2016, because Congress has provided less money than requested by the executive branch and generated by the FBF. The obligational authority for repairs and alterations declined from $855 million in 2005 to $10.3 million in FY 2017 and, as a result, even though the agency has access to a large amount of money, it claims to be unable to provide sufficient resources to handle all needed alterations, repairs, and construction. The Ex-Im Bank is an independent government agency founded in 1934 in an effort to encourage U.S. exports. In FY 2016, the Ex-Im Bank provided $5 billion in taxpayer-backed direct loans, guarantees, and export-credit insurance to private firms and foreign governments. The federal government can save money by reducing the number of unnecessary or excessive information technology (IT) software licenses, many of which are bought because the government is unable to keep track of which licenses its agencies currently own or use. A July 19, 2011, GAO report criticized government agencies’ inventory management of data centers, noting that 15 federal agencies did not list all their software assets in their reports. Provisions to improve SAM within the federal government were included in the House-passed version of H.R. 1232, the Federal Information Technology Acquisition Reform Act (FITARA). However, this provision was removed from the final version of FITARA included in the cromnibus appropriations bill that was signed into law on December 16, 2014.